The British Invasion is cited as one of the most significant countercultures on both sides of the Atlantic, influencing artists not just of the 60s and 70s but of nearly every decade since. For Jonny Stanback, Thomas Hunter, Scott Stone and Josh Roossin, their love for the cultural phenomenon is the main influence for their Southern Californian rock band, The Jacks. Stanback is the vocalist and rhythm guitarist, although he has been playing both guitar and piano since age 10. He brings his love for The Beatles to the table, whose “Beatlemania” started the British invasion. Lead guitarist Hunter started learning guitar at 8 years old and shares an admiration for Led Zeppelin with Roossin, who began drumming at age 9. Stone grew up idolizing The Who and picked up the bass for the first time when he was 11. Hunter and Stone grew up as childhood best friends and decided to form a band after attending their first concert together – The Who at Hollywood Bowl. Despite playing music together from junior high through high school and college, it wasn’t until they discovered Stanback at an open mic night that they really began creating original music. Once they found Roossin, the sound they were looking for came together. When they were looking to decide on a band name, it was nearly a year of playing and writing together before they settled on The Jacks. Their self-titled EP is set for an early 2018 release and was written, produced and mixed between the four of them and their engineer, Alex Boehnlein. The writing process began in late March 2017 and was recorded in San Diego later that summer. They elected to stay away from auto tune and click tracks, instead piecing together an authentic vibe that best represents them as a band. The songs reflect their experiences of growing up, from relationships with friends and loved ones to adventures as a band. From Beatlemania to Zeppelin to The Who, the counterculture of British influence in today’s music is reflective in more ways than one. 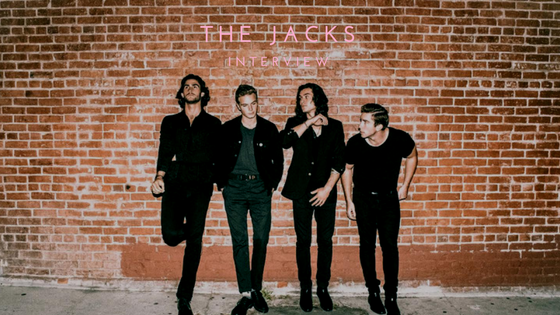 For The Jacks, it best represents who they are as people and as musicians. With new music in the near future and more tricks up their sleeves, this just may be their year.